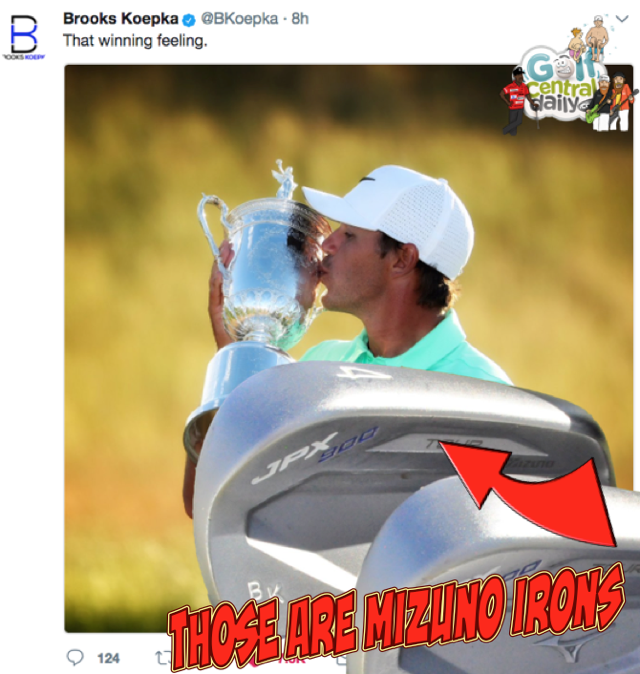 Brooks Koepka's win at the US Open highlighted a couple of things equipment wise, most notable of which is the move of uncontracted players back towards the quality of Mizuno equipment, especially irons. Mizuno as a brand has been swamped in the marketing stakes by the heavyweight budgets of TaylorMade and Callaway of late but as the old saying goes, "you can't put a price on quality" and this latest Major win go a long way to proving that. Initially a Titleist staffer, Kopeka then moved to Nike but when they exited the club industry he, along with many others, was left high and dry regarding equipment. However this initial head scratching seems to have precipitated the new trend of the mixed brand bag; something which has benefitted Mizuno greatly with the likes of Koepka, Casey, Chappell, Glover among many others now gaming them uncontracted. Mizuno initially gifted Koepka a set of JPX 900 Tour irons before he signed for Nike telling him that the actual design and even colour scheme of the irons were designed with HIM in mind. The clubs sat in his house unused for over a year before being picked up again when Nike announced they were shutting shop. Now Mizuno get to claim get to claim the latest Major Champion, without any money spent other than the price of a set of clubs! Koepka hit 17 of 18 greens in regulation in his final round with his Mizuno JPX-900 Tour irons gaining 5.181 strokes tee-to-green. The other point of note on Brooks bag set up will bring joy to the ears of owners of the original TaylorMade M2 driver. That's the one he gamed at Erin Hills but he did also bomb an M2 Tour 2017 3-wood 378 yards off the final tee so they must be pretty good too!! Driver: TaylorMade M2 2016 (9.5 degrees) with Mitsubishi Rayon Diamana D+ 70TX shaft. 3 Wood: TaylorMade M2 Tour 2017 (15 degrees) with a Mitsubishi Rayon Diamana D+ 80TX shaft. Driving Iron: Nike Vapor Fly Pro (3) with a Fujikura Pro 95 Tour Spec X-Flex shaft. Irons (4-PW): Mizuno JPX-900 Tour with True Temper Dynamic Gold Tour Issue X100 shafts except PW which is an S400. Wedges: Titleist Vokey SM5 (48, 52), Titleist Vokey SM4 TVD (60) all with True Temper Dynamic Gold Tour Issue S400 shafts.